Can Opioid Addiction Be Treated With Heroin? As America's drug crisis booms, the RAND Corporation released a report Thursday calling for clinical trials testing the effectiveness of doctor-administered heroin to treat opioid-use disorders. Recently released public health data indicate that the United States remains in the midst of a full-blown public health crisis, thanks largely to the explosion of drug overdose deaths. Drugs, especially opioids, are now the leading cause of non-medical death in the United States, outpacing historical highs for gun, car, and AIDS deaths. Alongside suicide, drug overdoses are primarily to blame for year-on-year declining male life expectancy, an almost unprecedented event in modern times. The driver of these surging figures is the synthetic opioid fentanyl and its numerous analogs. The drug, which is synthesized in laboratories in China and then mailed to the United States or smuggled over the border, is both cheap and potent. 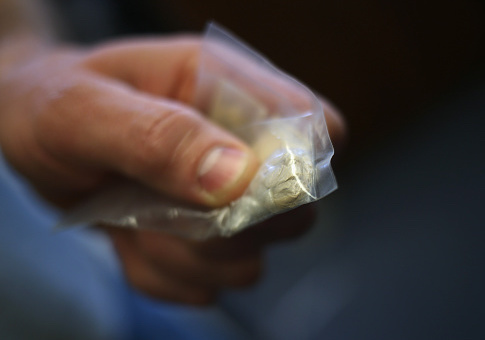 What is more, most users are exposed to it unwittingly—fentanyl is hard to identify, and has appeared in cocaine, illicit prescription pills, heroin, and party drugs like MDMA. With a hyper-potent, deadly drug spreading through the drug ecosystem, policy makers have an interest in reducing users' exposure to potentially adulterated substances and thereby lowering their mortality. Techniques for doing so are known as "harm reduction," and focus on reducing mortality and morbidity even if it means providing a person with an opioid use disorder the drugs they desire directly. The problem of fentanyl adulteration prompted researchers at RAND (a nonprofit, nonpartisan think tank) to consider which harm reduction techniques would be most effective for protecting current users from exposure. Their report explores both so-called Supervised Consumption Sites (SCS) and programs which give users access to "prescribed" heroin, called Heroin-Assisted Treatment (HAT). Although never implemented in the United States, HAT has a surprisingly lengthy history of use in other countries. The United Kingdom has had a heroin-prescribing regime since the early 20th century, although it has changed form substantially in that time thanks to high mortality among patients in the 1960s and 1970s. Other countries—including Switzerland, the Netherlands, and Canada—have implemented their own versions. Modern HAT regimes take a fairly specific form. They are usually restricted to people who are severely opioid-dependent, and for whom exposure to other opioids used for treatment—methadone and buprenorphine, principally—has not been effective at reducing use. In that context, individuals are usually prescribed one or more daily doses of diacetylmorphine (the generic name for heroin), often alongside oral methadone, which is administered under the supervision of a licensed medical professional. Despite their use in other countries, HAT and SCS are illegal under U.S. federal law. Heroin is schedule one under the Controlled Substances Act, meaning it is highly addictive and has no accepted medical use; as a result, it cannot be prescribed. Running an SCS is also illegal under the CSA's "Crack House" statute, which prohibits running a facility to distribute a controlled substance. The RAND analysis concluded that within the substance-dependent population for whom methadone maintenance treatment (MMT) alone has been unsuccessful, HAT is likely to be effective. "Evidence from all studies reviewed indicates that supervised injectable HAT with optional oral methadone can offer benefits over oral methadone alone for treating [Opioid Use Disorder] among individuals who have tried traditional treatment modalities, including methadone, multiple times but are still injecting heroin," the review noted. There are a couple of caveats to this conclusion. The variable of interest in the studies RAND reviewed was retention in treatment between HAT-exposed users and those who simply received MMT. But in many of the studies, those assigned to the MMT-only group dropped out immediately; and some in HAT groups switched to just methadone, which counted them towards retention even though they did not stay on HAT. HAT also naturally comes with trade-offs. Most of the research reviewed by RAND and others found a higher risk of "adverse events"—including seizures and respiratory depression—in the HAT group compared to the MMT-only group. There did not appear to be a strong difference in mortality between the two groups (i.e., HAT subjects did not appear more likely to die than MMT-only subjects), but the number of deaths involved in any given study was low enough to make it hard to reach a conclusion about the significance of the difference. Further, the frequency of adverse events indicates that HAT may have comparable mortality to MMT only because of the heightened supervision—again, an effect of different administration, not different drug. Still, RAND's conclusion meshes with other, similar surveys of the research that have been conducted in the past. A Cochrane systematic review (the gold standard in healthcare research) found that HAT helped patients remain in treatment and reduced use of drugs compared to MMT-only control; a meta-analysis in the British Journal of Psychiatry found the same. One study saw a nearly 30 point jump in retention rates between HAT and control, as well as a substantial reduction in daily use. The bigger question—which RAND raises but does not conclusively settle—is how much of HAT's effect is attributable to enhanced surveillance compared to MMT-only. Methadone can be taken orally at home, while responsible HAT requires oversight by a trained professional (when the British tried take-home heroin, mortality spiked). The analysis found that HAT participants were less likely to engage in criminal behavior than MMT-only participants, and suggested that may be a surveillance effect. In other words: HAT's comparative efficacy over MMT may be an effect of increased exposure to medical professionals more generally, rather than the enhanced strength of heroin over methadone. Such questions are in some sense secondary to the overwhelming urgency associated with taking street-acquired drugs in a market where any sample might conceivably contain a deadly dose of fentanyl. As such, the RAND report called for U.S. jurisdictions with the requisite means to conduct further research into HAT, an activity permissible under the CSA assuming certain constraints are observed. Such a program, if implemented, would give important insight into how heroin interacts with the U.S. drug market, as well as potential concerns about scaling HAT. Much of the current drug crisis was driven initially by either illicit prescriptions of opioids or the diversion of licit prescriptions—permitting doctors to prescribe heroin, as one Washington Post editorialist suggested, could have wide ranging unintended effects on the drug supply and thereby exacerbate, rather than tame, the overdose epidemic.